Tokyo, January 20, 2017 --- EDOGAWA LUMBER INDUSTRIAL CO.,LTD. (“EDOGAWA LUMBER INDUSTRIAL”) and Hitachi Automotive Systems, Ltd.(“Hitachi Automotive Systems”) today announced the joint development of an anti-seismic oil damping system that can be attached to the columns of housing and improves the workability of application to detached houses and anti-seismic remodeling. The companies will begin selling the oil damping system to Japanese housing construction companies starting February, 2017. There is a growing focus in recent years on making wooden housing earthquake resistant by equipping the housing structures with anti-seismic systems able to withstand large earthquakes, which is generating an increasing demand for shortening the construction period and reducing the cost of the anti-seismic remodeling work required. 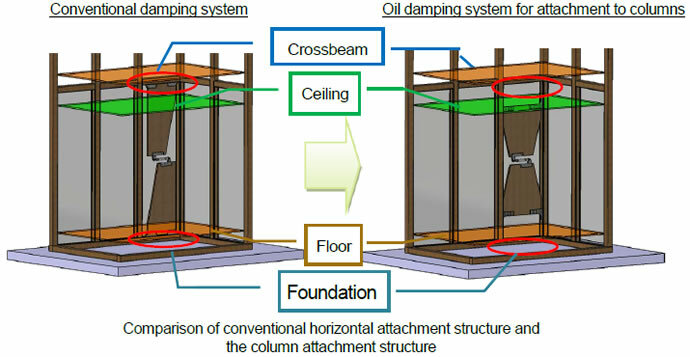 The new column-mounted anti-seismic oil damping system developed by EDOGAWA LUMBER INDUSTRIAL and Hitachi Automotive Systems is attached to buildings through use of improved attachment brackets, whereby instead of the conventional horizontal attachment to a building's crossbeam and foundation, the installation of the damping systems can be completed just by attaching them to the columns, forming a structure with excellent workability. Previously, such installations had to be affixed from the superstructure to the under-floor foundation in order to increase the efficiency of earthquake vibration absorption. With the new structure, however, vibration absorption efficiency can be maintained by simply installing the damping system between the columns of the building, making it possible to carry out anti-seismic remodeling on walls without installation work having to extend to the ceiling or floor. As a result, anti-seismic remodeling is simplified, which shortens the time the work takes and reduces the cost. Anti-seismic systems currently employed in housing construction include seismic damping using rubber, friction, steel, and oil. In addition to its high durability, features of the new anti-seismic system using oil damping include that it is good at damping repeated earthquakes. It can absorb small initial shaking to large quaking motions and has good vibration absorption efficiency that reduces the burden of quake oscillations on buildings. Hitachi Automotive Systems has applied its oil damping technology used for automobiles and railway cars to seismic control devices for buildings and other large structures. 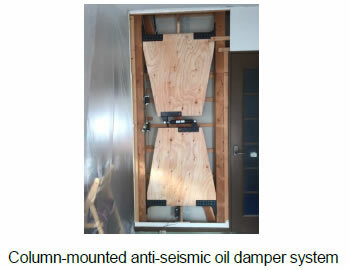 In 1998, EDOGAWA LUMBER INDUSTRIAL and Hitachi Automotive Systems jointly developed an anti-seismic system for detached house applications that combined an anti-seismic oil damper with plywood. Since 1998, the two companies have shipped a total of some 70,000 of those systems for new construction and remodeling. In Japan, where earthquakes frequently occur, the effectiveness of its vibration absorption performance with respect to major, repeated earthquakes as well as the durability performance are such that even around 60 years* after installation, no maintenance checks are required, earning the company high praise from housing construction companies throughout Japan. EDOGAWA LUMBER INDUSTRIAL and Hitachi Automotive Systems will continue to contribute to the increase of safe, secure, and comfortable living spaces by providing seismic control systems for detached housing that are highly durable and exhibit excellent anti-seismic performance and workability. About EDOGAWA LUMBER INDUSTRIAL CO., LTD.
EDOGAWA LUMBER INDUSTRIAL CO., LTD. is a housing industrial selling and construction company, headquartered in Tokyo, Japan. The company is engaged in the manufacture and sales of construction materials, renovation design, and the sales and construction of damping construction methods.